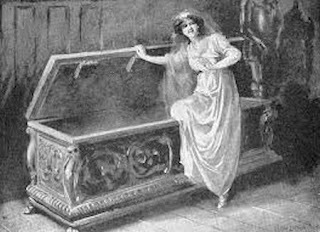 Today's story fits the Victorian, and even earlier, tradition of telling spooky stories. Charles Dickens was far from the only author bring goosebumps to the holiday. Back on October 17, 2013 here I devoted an entire article to Scary Ghost Stories for October, December, or Whenever. At the time I mentioned on the My Merry Christmas network I posted this spooky ballad from 1830, The Mistletoe Bough, based on various traditional legends. I don't recite the ballad as it is written, instead I tell the story, getting the audience to repeat the refrain. It starts out a happy and merry chorus, changing as the tale evolves. Because the link above takes you to where I posted it on MyMerryChristmas.com, I will give it here as I originally did it. This is actually a ballad with lyrics by Thomas Haynes Bayly. I’ve never been able to find the music by Sir Henry Bishop, but I use the refrain for my own re-telling as it’s said to be based on a traditional legend. “Here, tarry a moment — I’ll hide, I’ll hide! And young Lovell cried, “O, where dost thou hide? I hope you got a bit of a shiver from that tale and enjoy telling it your own way. Next week we'll choose something a bit livelier from Victorian Christmas tales.